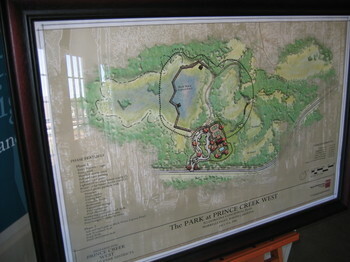 The photo is of a graphical depiction of a park that will be built close to the Ryland development they are selling. It is an "in writing snapshot" of future plans by the developer to build a "buyer benefit" for all the new home builders in the development. This is what new home buyers need to have a visual, permanent record of what they are being verbally told should happen eventually. However, when it comes to sales incentives like Ryland Homes paying up to $3,000 in "non-recurring closing costs" (Ryland's definition of what specifically is "non-recurring" should be in writing), and $10,000 in free Ryland upgrades, there are no written documents (online or on paper) that state the details and contingencies of those incentives to get them when someone buys a Ryland home. This places a burden on the Ryland sales agents that have to remember to verbally tell all prospective buyers all the contingencies that materially affect that incentive offering in a clear, conspicuous, comprehensive, comprehendable, and upfront way. Hopefully, no buyer or seller wants any "misunderstandings", and last minute surprises. I strongly suggest that Ryland Homes insure that they have proof that they are following FTC guidelines about "Advertising" by putting these details and contingencies on their web site, so that they can be easily changed, as the incentive dates and details evolve. The only thing on Ryland's web site about these things related to Ryland's in house financing incentive of a lower rate when I put a deposit down on my Ryland home, and I did not use Ryland financing when I bought. Before you finish reading this post, please be aware that my wife and I did not enjoy our first year of Ryland Home ownership. See "My Last Ryland Homes Blog Post & My Attempt To Help Ryland Homes!" to get a better overview of our Ryland Home complaint to the BBB, and links to the over 100 Ryland Home problems that were all eventually fixed after 13 months of having much of our time wasted.